29 ноября легендарная рок-группа Rolling Stones объявила о предстоящем европейском турне, в ходе которого она посетит Россию, сообщает ИТАР-ТАСС. Турне начнется 27 мая с концерта в Барселоне. Затем группа выступит в Голландии, Германии, Франции, Бельгии, Италии, Испании, Великобритании. Россия попадет во вторую часть турне вместе с Грецией, Хорватией, Швейцарией, Португалией и Ирландией. Re: Группа Rolling Stones выступит в России!!! EUROPEAN TOUR CONFIRMED FOR SUMMER 2006. The most exciting and powerful rock 'n' roll show in the world is coming to the stadiums of Europe next year. Kicking off on Saturday May 27, 2006 at Barcelona's Olympic Stadium, The Rolling Stones - A Bigger Bang European Tour - will play over twenty countries at the most famous stadiums and venues in the world. Mick Jagger, Keith Richards, Ronnie Wood & Charlie Watts announced today that there will be over 30 European concerts in 2006. They confirmed dates in Holland, Germany, France, Belgium, Italy, Spain, Sweden, Norway, UK, Poland, Austria and The Czech Republic. Tickets for all these markets will go on sale to the public from December 3rd 2005. (dates, cities & venues). Additional concerts in Russia, Greece, Croatia, Serbia & Montenegro, Portugal, Denmark, Switzerland and Ireland are also confirmed with venue and/or on-sale information to follow. In keeping with the band's philosophy of making their shows accessible to all fans, tickets for the stadiums will be available in a broad range of price categories. The average price of tickets across Europe is 75 euros. Anticipation for the tour is already running at an all-time high following the incredible critical and box-office response to the Stones' North American shows. 'A Bigger Bang' world tour opened in Boston in August 2005, when The Rolling Stones rocked Fenway Park Stadium with a stunning performance. Critics were as one in their admiration for the unrivalled exuberance and sheer excitement that continues to characterize the live Rolling Stones experience. In Europe, the Stones will fulfil the ultimate dream of music lovers across the globe, offering the unimaginable - the opportunity to be onstage with them. Several hundred seats are built directly into the stadium set, offering fans the once-in-a-lifetime opportunity to share the excitement and adrenaline rush of being onstage as the Rolling Stones perform to an audience of 50,000 plus. 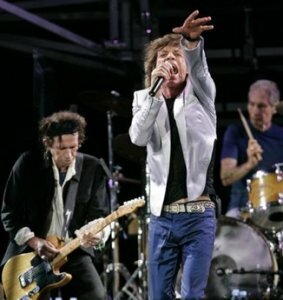 "The band is redefining the concert experience - there is nothing even comparable to the thrill of being onstage with the Rolling Stones and seeing a stadium show from the band's perspective," said Michael Cohl, tour director, "For fans this will be the greatest tour yet"
The tour has been rolling through North America like an unstoppable locomotive since the Boston shows, picking up ever greater praise along the way. Devoted fans and critics have hailed Mick Jagger's aura as the world's greatest rock frontman, Keith Richards' awesome effervescence as the ultimate guitar maestro, Ronnie Wood's brilliant guitar intricacy and the redoubtable energy of the engine room that is Charlie Watts. Demand for Europe's hottest ticket of 2006 is certain to be as feverish as that in North America this summer and fall, where capacity has run at 100% throughout the entire run of stadium and arena shows. "Superstars remain superstars," wrote Billboard magazine's Ray Waddell. "The Rolling Stones remain monster attractions." The Rolling Stones set the bar for the live modern rock spectacular and have continued to raise it tour after amazing tour. They hold the record for the top 2 most attended North American tours of all time - 'Licks' and 'Bridges To Babylon'. This show also includes an amazing technological extension of the famous "second stage" feature of recent tours. Not to mention that among dozens of their all-time classic songs, the Stones' ever-changing set list also boasts show-stopping tributes to such legends as Ray Charles & Bob Marley. The Rolling Stones A Bigger Bang European Tour is presented by American Express. 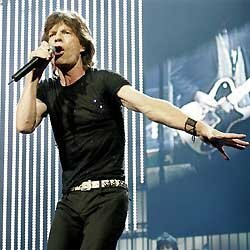 "Partnering with the Stones on the European leg of their milestone tour is a great privilege for American Express, and we're fortunate to be able to extend this privilege to our Cardmembers in the form of special, once-in-a-lifetime access to these legends of rock-and-roll," said John Hayes, Chief Marketing Officer, American Express. American Express has a long history of providing special access and meaningful experiences to Cardmembers. As part of this ongoing commitment, American Express has partnered with the Rolling Stones to secure a special opportunity for Cardmembers to purchase their tickets prior to the general public on-sale (in select markets and venues), for what promises to be an incredible tour. See attached for American Express early on-sale details. Fans are able to enjoy special access to tickets, exclusive erchandise and can also follow the tour online at www.rollingstones.com. For the first time ever, concert goers will be able to see the exact seat locations and choose the price level of tickets before purchasing a platinum membership to the fan club. Every ticket sold for the tour will include a free Virtual Ticket membership in the Rolling Stones fan club. Updated daily, users will be given an exclusive insider's look at every aspect of the tour. From rehearsals and preparations to on-going coverage via audio and videos streams, downloads, set lists and news and much more. Rolling Stones World Tour 2005/2006 will be presented by Concert Productions International and The Next Adventure and produced by WPC Piecemeal Inc.
Кстати, цены на билеты (предварительная продажа) в Бельгии: от 75 до 100 евро, в Германии: от 80 до 165 евро, в Голландии: от 79 до 129 евро. Интересно, а что значит State: SS? SP - Испания, BE - Бельгия, FR - Франция и т.д., а что же такое SS? Лучшая новость за последние 100 лет!!! Спасибо, Alex GB! Новость-то лучшая, да как бы тебя опять в Магатэ не сослали на это время. >не сослали на это время. Так надо постараться, чтоб не сослали. Жаль что выпала Финляндия.В Питер нам попасть труднее.Россиянам искренние поздравления! Группа Rolling Stones выступит в России!! !